Black tea is better known for its benefits than for any type of side effects. But it contains two natural substances -- caffeine and tannins -- that have the potential to cause digestive problems, such as an upset stomach or nausea. The key is to enjoy black tea but don't go overboard. Only large amounts of caffeine and tannins are likely to produce unwanted side effects. Green and black tea are both made from the leaves of the Camellia sinensis plant, so they start out with the same plant-based substances called flavonoids. The leaves are simply steamed and dried to produce green tea. To make black tea, they're allowed to ferment. During the fermentation process, the flavonoids change. As a result, black tea ends up with different flavonoids than those in green tea. The black tea flavonoids, called thearubigins and theaflavins, may also offer health benefits, such as lowering your risk of having a heart attack, according to research cited by the Linus Pauling Institute. Caffeine can cause several problems in the digestive tract. It boosts the amount of acid in your stomach, which can give you an upset stomach or cause heartburn. It also has a diuretic effect, so you eliminate more fluids through your urine and may become dehydrated. When you consume caffeine, it stimulates the muscles that push wastes through your digestive tract. While this can help if you're constipated, it may result in diarrhea. Caffeine can also aggravate gastrointestinal conditions such as irritable bowel syndrome, reports the University of North Carolina Wilmington. Tea contains natural substances called tannins, which contribute color and a slightly bitter flavor. If you drink a moderate amount of black tea, tannins should not cause problems. In large quantities, they may upset your stomach or cause nausea and vomiting. Tannins may interfere with the absorption of nonheme iron, which is the type of iron found in plant-based foods. However, drinking tea is not associated with iron deficiency unless you're already anemic or at a higher risk for developing a deficiency, reports a review of research published in the "European Journal of Clinical Nutrition" in January 2007. Drinking 200 milligrams to 300 milligrams of caffeine daily is safe for most people, reports MedlinePlus. With 30 milligrams to 80 milligrams of caffeine in an 8-ounce cup of black tea, that works out to a maximum of 4 cups to 10 cups daily, depending on the actual caffeine content of the tea. You can reduce some of the caffeine by brewing the leaves for a shorter amount of time. A cup of tea brewed for one minute has half the caffeine as tea that was steeped for three minutes. 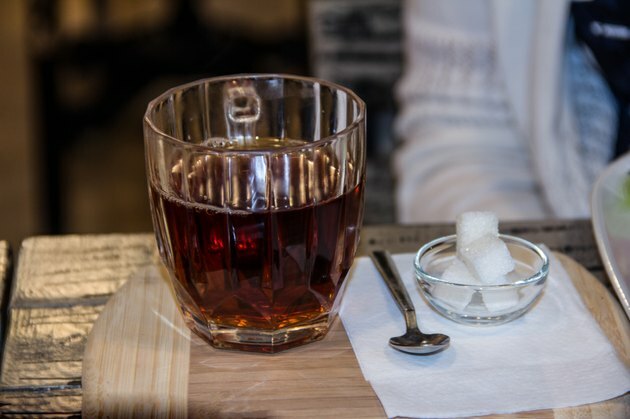 If you're at a higher risk for iron deficiency, drink your tea between meals and wait at least one hour after eating before having a cup, recommends a February 2004 report in the "Journal of Human Nutrition and Dietetics."